Over the past few weeks, we've been hearing from more and more customers that are excited about their upcoming trips to PBP. I know of two new VO Rando frames that will be rambling around the French countryside this year, and maybe there will be more. 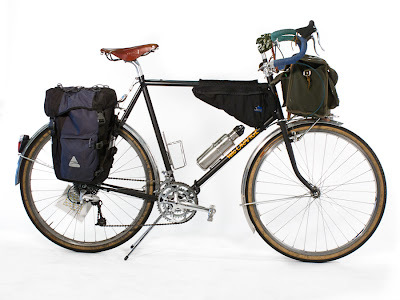 This year we've also chatted with a couple folks looking for new handlebar bags for the ride. Are any blog readers heading to France next month? What are your goals for the ride? 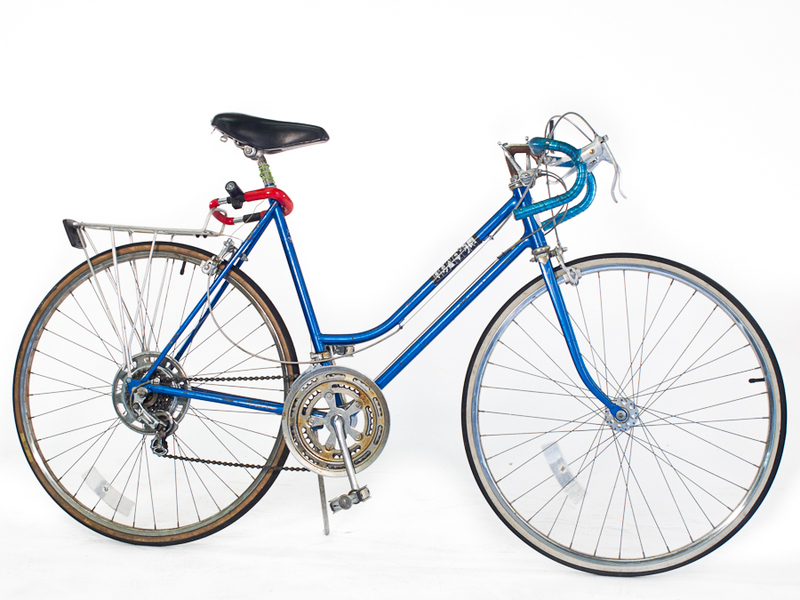 What kind of bike will carry you across the finish line? Would you care to share your bike number with us so that we can watch your progress on the PBP website? I'd like to take the chance to wish a public "Bonne Route" to folks from our local club who are headed to Paris, and to some of our dealers who are taking time off to join the ride. After the spring brevet season slowed down, most people around here who plan to head to PBP transitioned into a different kind of training. I've joined these folks for some short weekend tours - getting up early, riding hard, eating well, and having a few laughs is the best "training" I can imagine. Riding PBP is not an easy task, but all of these folks are ready! So, best wishes to the amazing tandem couple, Ed & Mary. And all the other DC Randonneurs going to PBP: Carol, Charlie, Cindy, Gary, George, John, Kelly, Maile, and Nick. We're also trying something new. 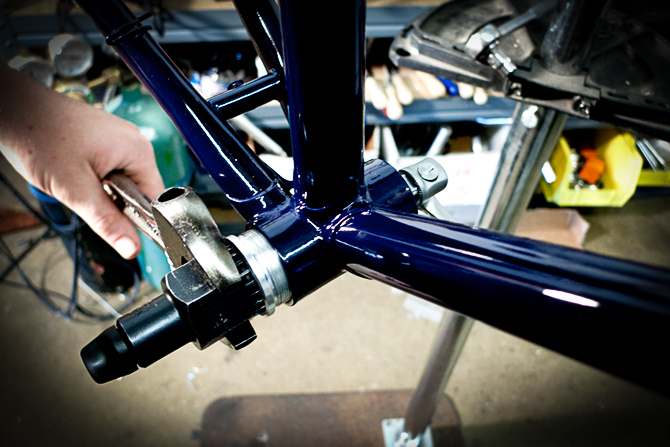 For $40, we'll chase the bottom bracket threads, face the head tube, and install the bottom bracket and headset cups for you. You won't find a deal that good at any bike shop, and it will save do-it-yourselfers even more in expensive specialized tools. In most cases, you won't need any special tools for the rest of the assembly. Home mechanics, rejoice! If this is an idea that interests you, please speak up! We're in love with the idea of building machines whose parts all work together in harmony. I think we're getting close with the parts that come in this kit. 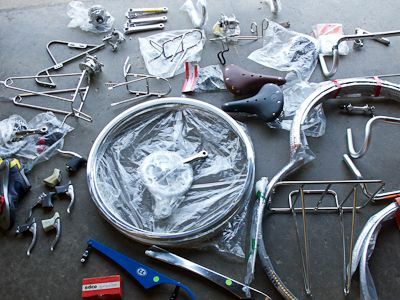 Most of the ingredients needed for a commuter, club-rider, or sport tourer are all in the Maxi Build Kit. Our next project may involve a complete bike, designed around our Polyvalent frameset. It's a big step for us, so we're going to see how things go with the Maxi Build Kit. Are all of the pre-chosen parts restrictive or do they liberate you from the burden of choosing minor details? How do you folks feel about having the heavy wrenching taken care of for you? Dealers: these are available to you, too. Although Chris has stepped out for a few weeks, we still have lots of news. There's a new video online, and more will be up in the next few weeks. What would you like to see on our Vimeo channel? We're working on some more instructionals and fun things, but are interested to know what people would like to see most. 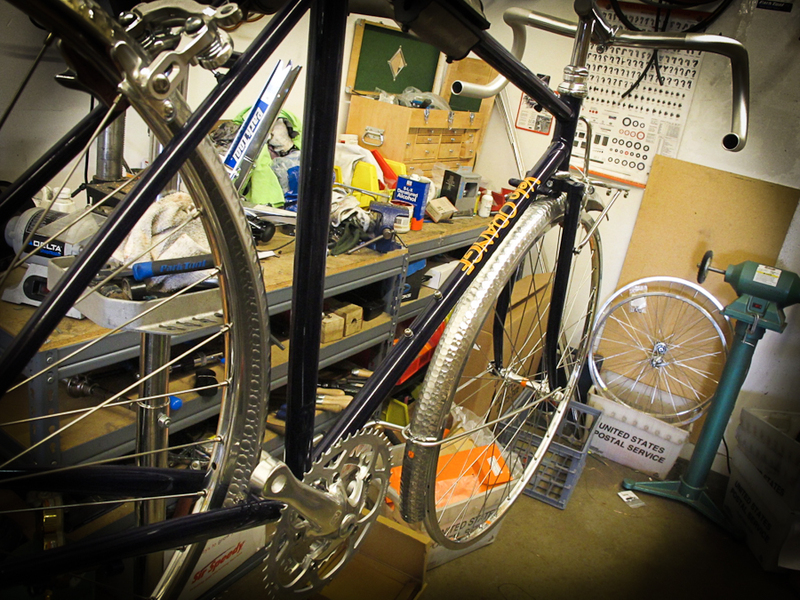 Robert's cyclocross bike - Challenge tubulars, VO stem, VO cable housing..
Scott's Gunnar - speedy randonneur bike. Kyle's touring bike - VO Polyvalent. You've probably noticed that we've got a lot of VO parts and frames. This isn't because we get a great deal on them (it helps), but because we're serious about our products. 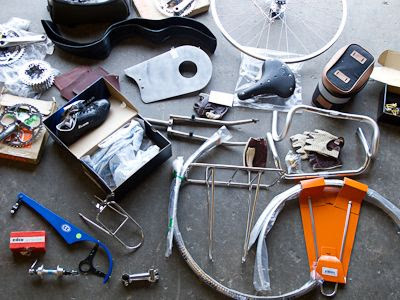 We make the stuff we like and want, and test parts thoroughly by strapping them to our own bikes to discover what works and fix what doesn't. The Tall Stack Stems, that many of you have e-mailed about, should arrive next week. 650b wheels and GC touring hub wheels should be here within a few weeks. 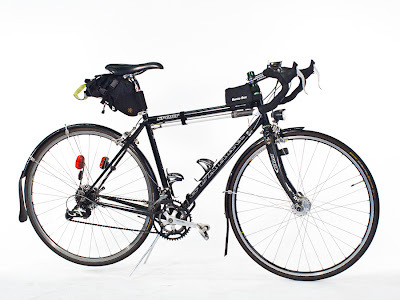 Contructeur front racks have been out of stock for month, but we should have more in 3-5 weeks. Metallic brake and derailleur cable kits are on the way, 3-5 weeks. Copenhagen kickstands are in the same shipment. All sizes of Uno sp-248 seat posts are also on the way. 50.4bcd cranks have been delayed for at least a couple of months, no ship date yet. Sorry about this. Another container is due around the end of the month and most other items we're out of will arrive then. 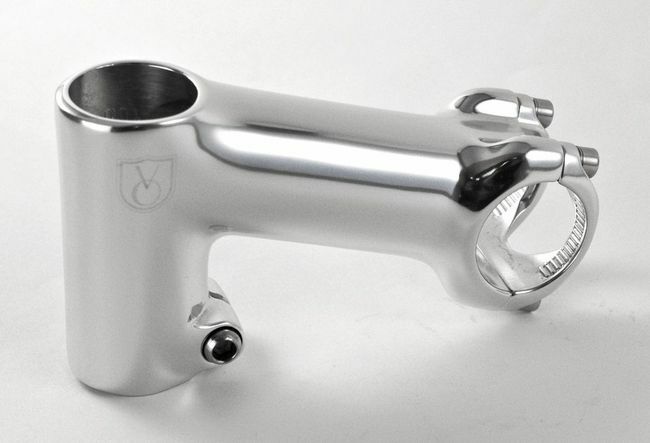 Bike shops in Canada can soon order VO and Grand Cru products from our new distributor, Fourth Floor Distribution. We are working on a Maxi Frame Build Kit which will include most of the parts required to build up a Rando or Polyvalent kit. We'll have details in a few days. I'll be traveling for the next three weeks, but the VO staff will maintain the blog. 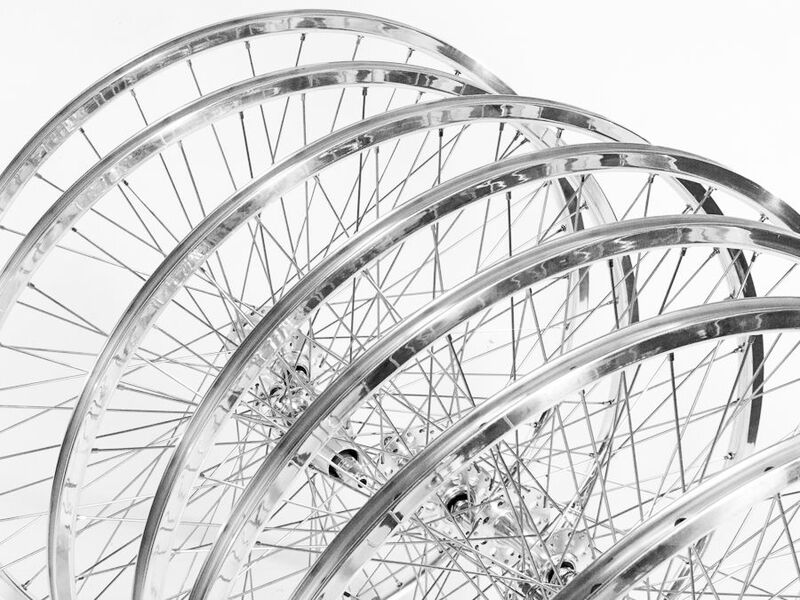 The Cycloculture blog has been well regarded for their collection of interviews with bike designers, builders, and others in our industry. Unfortunately their standards may have have fallen recently, as they even published an interview with me. 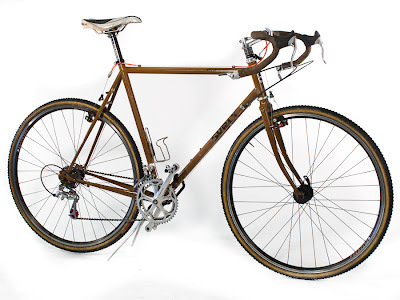 The Lazy Randonneur has some nice things to say about our bars and stems. He also likes our headsets. The build is a 26" LHT. 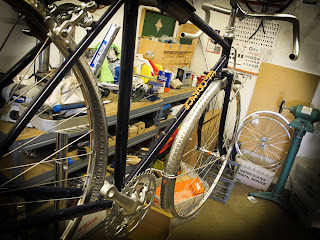 I've always like this blog, and not only for the bike content. 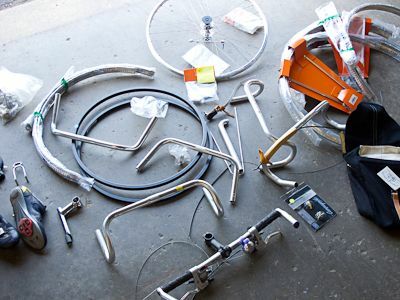 We just received a big shipment from our wheel building company. We'll do a little QC and photograph them today. The new wheels should be on the site soon. This blog started out as, mostly, my blog and has evolved into an, almost, official company blog. We've recently been publishing more posts by other staff members, and I hope that trend continues. As part of the transition we're switching the Twitter feed from my tweets to the official VO account. I hope you follow both. Once again we've accumulated a big pile of odds and ends, literally hundreds of items. Rather than put them on the site we'll offer them all at the second VO garage sale. Prototypes, items we've used on display bikes, items from test bikes, seconds, overstock, returns, and even a few personal items from our employees are for sale. 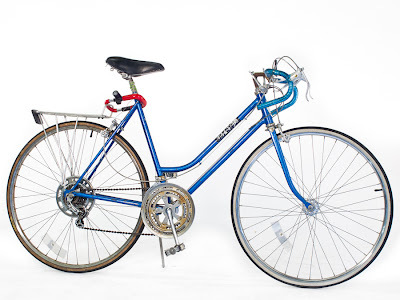 There are wheels, racks, fenders, cranks, a couple of frames, bike luggage, handlebars, stems, etc. Most everything is priced at about half the retail price. We'll also offer any regular in-stock items at 15% off; this reflects our savings in not having to pack and ship the orders. The sale will be held from 9am to 1pm on Saturday July 9th, rain or shine. The last sale was big hit, so get here early for the best stuff. The Garage sale will be at the VO warehouses and office, 1819 George Avenue, Annapolis MD, 21401. The 15% discount is available to those who buy in person, not on-line. Items on sale not included. If you ride your bike to the sale you'll get a free VO Poster. Garage sale stuff is non-returnable.